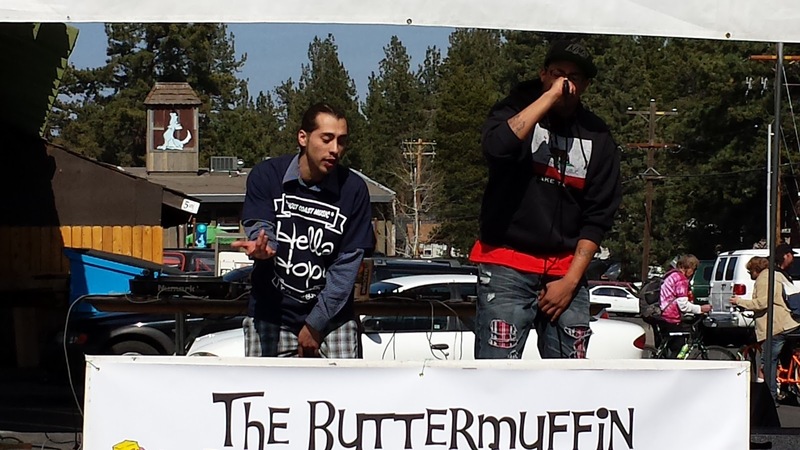 April 19th and 20th at the Swiss Chalet Village were the second annual Buttermuffin smoke shop 4/20 event and the grand opening of Mad About Music's new location on National Record Store day. The event featured a glass blowing competition, live art demonstrations from Will Eicheberger and Michael Vee, and concerts from 6 DJs on 4/19 plus Reggae band Rise Up and local rappers Dreda Dre and One Love on 4/20. Will Eichelberger described his art demonstration this way: "I'm here at the 4/20 fest doing some live art and it's pretty awesome because it's a great day out. I am a photographer, so I shoot photographs and make really large prints of them. I then paint backgrounds on wood, canvas, or found objects and wheat-paste the prints to them street-art style." Mad About Music Owner Dan Berger said: "I am the new owner of Mad About Music, I purchased it from +Jonathan Lee and Chris, the old owners.... It's national record store day so we've got a bunch of records outside, we've got booths, we've got vendors..." He went on to note that DJs that day included DJ Rundown, DJ Shortem, Aux, TYMK, Bass-Mentality, and Nas Ja. Berger noted the history of the place: "We're keeping the tradition alive for Mad About Music, we're back in the Swiss Chalet while the original spot was where Elephants music is now, so we're bringing it back full circle." Click here for the full playlist of Tahoe Onstage 4/20 interviews if your browser does not support embeded playlists.